Ingredients when reconstituted: potato, onion, green beans, wheat starch, wheat flour, maltodextrin (from wheat), salt, carrot, sunflower oil, sugar, yeast extract, flavours (contain milk, soybean, wheat derivatives), colour (caramel IV), food acid (citric), spice extracts, garlic extract, herb extracts, beef extract. Allergens:Contains wheat, milk and soybean products.Manufactured on equipment that also processes products containing peanut, egg, sesame, fish and crustacea. 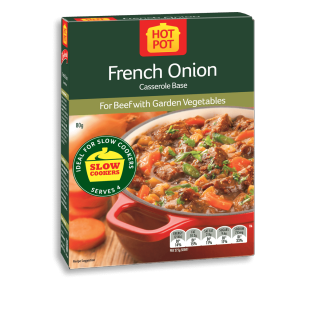 BEEF WITH GARDEN VEGETABLES Serves 4 500g cubed topside, bladebone or other beef 1 tablespoon oil 1 packet French Onion Hot Pot 2 cups (500mL) water 1 tablespoon brown sugar 1 tablespoon wholegrain mustard 2 carrots, sliced STOVE TOP Preparation: 15 mins Cooking: 30-90 mins Brown meat in hot oil, in batches if necessary. Add Hot Pot, water, brown sugar, mustard and carrots. Bring to the boil, cover and simmer gently until meat is tender, stirring occasionally. Allow 20-30 minutes for tender cuts such as topside or round steak; 1 - 1 1/4 hours for less tender cuts such as chuck steak. For other cooking methods like oven or slow cooker see pack instructions.